Using our official Shopp + SalesBinder Plugin, you can integrate all of your inventory data (in near real-time) directly into your website and have all your internet sales automatically entered into your SalesBinder account. 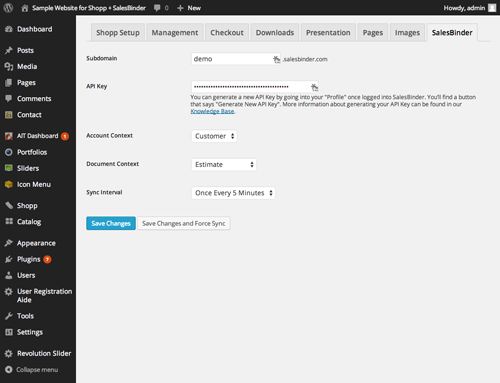 This plugin will automatically sync your SalesBinder data into the Shopp Plugin and place your inventory data into the “Catalog” -> “Products” section. No custom theming required. In the WordPress Dashboard you will find a new 'SalesBinder' tab under "Shopp" → "Setup" → "SalesBinder"